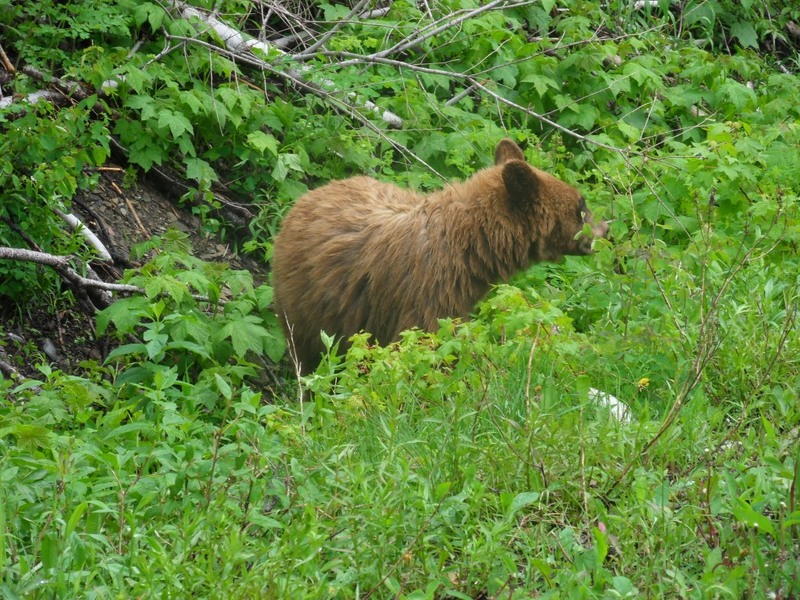 Photograph 1 – A young grizzly bear near Jackson Glacier Lookout. This bear just walked across the road right next to our car. On the Going-to-the-Sun Road, Glacier National Park, Montana. Photograph 2 – And again, using Anne’s camera. Anne was the closest to the bear when walking past. 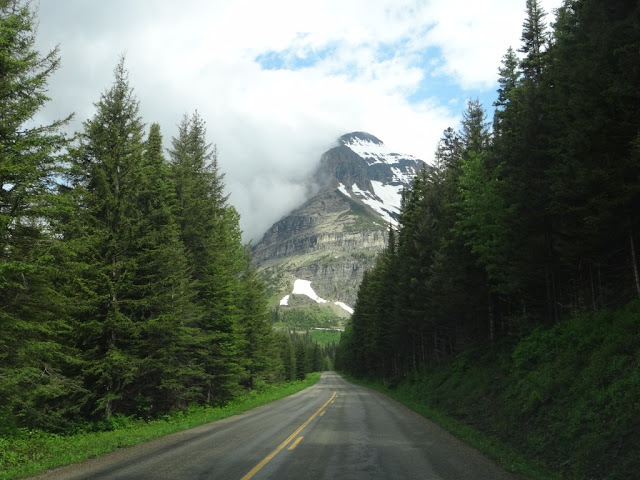 Photograph 3 – A beautiful scene heading towards Logan Pass on the Going-to-the-Sun Road. Not far when we spotted the first grizzly bear. Photograph 4 – The bridge over the St Mary River, just one mile from our accommodation. Two interesting things here, first this was the bridge that Forest Gump crossed in the movies of the same name (he appears to be everywhere in the US that we have been). Secondly, our second grizzly bear sighting was a few hundred metres before this bridge. WE SAW TWO GRIZZLY BEARS IN THE WILD TODAY!!! It was a rest day, just recuperating after many days of long driving. 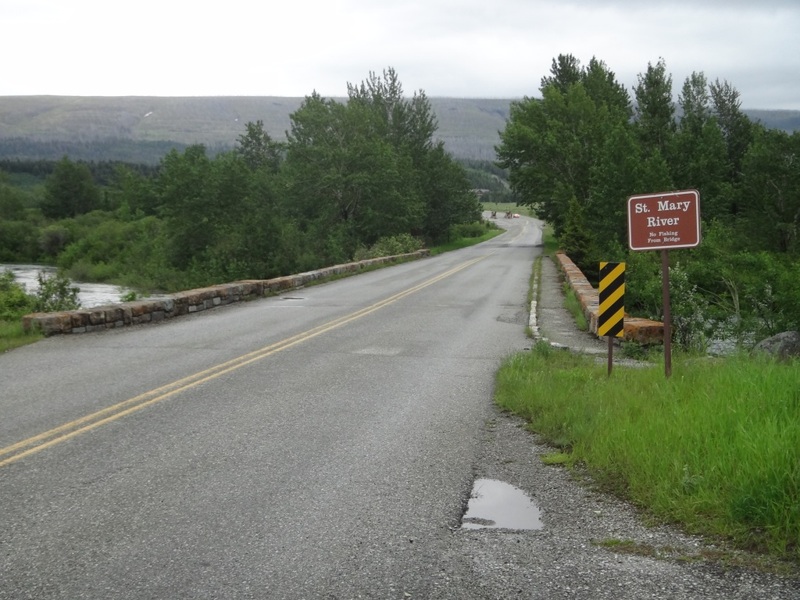 We are still at St Mary, Montana just a few hundred metres from the eastern entrance to the Glacier National Park. To allow the housekeeper to clean our room we decided to take Connie to Logan Pass on the Going-to-the-Sun Road and repeat what we did yesterday by the Red Bus. About half way there a young grizzly bear who just walked across the road as if we were not there. We stopped and took pictures while he or she was scrounging for food along the edge of the road….amazing! Apparently bears spend 90% of their time digging around for plants and searching for berries. The other 10% - experts don’t explain. Perhaps it’s their amorous quality time or changing their diet from herbaceous to a carnivorous cuisine??? After the excitement in seeing a real life “free” grizzly bear in the wild we continued to Logan Pass. At the visitor station on top of this pass they were selling cuddly toys. Anne had to buy (or should I say adopt) a grizzly bear! 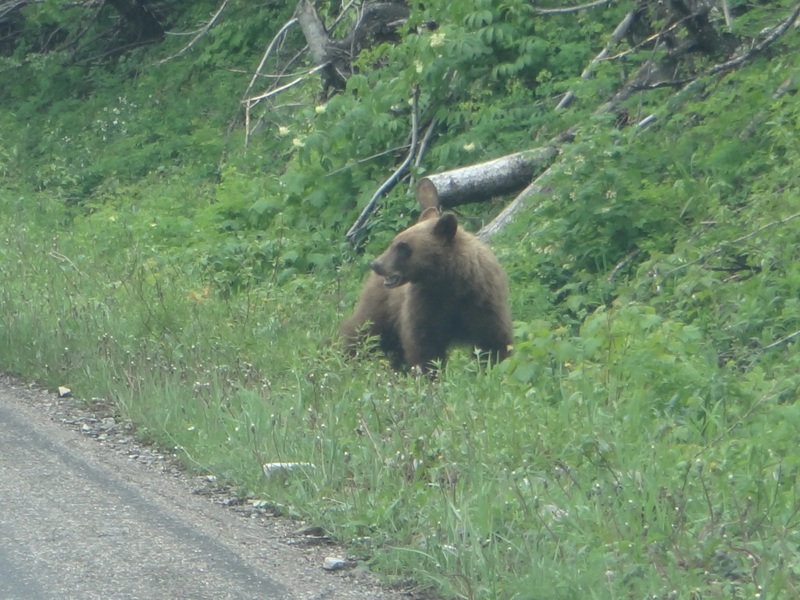 Going back down the road and near the end we saw another grizzly…..this time it was twice the size and darted in the forest next to our car. It was difficult to take photos because of the vegetation was dark and the bear was behind many trees. Wow – two in one day. We think the reason why these great animals were on the road is because the weather was inclement. In fact by the time we arrived back to our accommodation (12:30pm) it poured and actually hailed. This is our first day of rain since we have been on the road….but who cared…..it was our rest day. The afternoon was just relaxing in our lodge and repacking our bags. Tomorrow we are back on the road again and heading west to Spokane in Washington state. Damn it… we have to cross over the Going-to-the-Sun Road again along he Glacier National Park to travel west. This time we have to press on past Logan Pass to descend into the Pacific Rockies. The good thing about this is - passing by the same spots where we saw the bears – we might be lucky again tomorrow. Readers of this narrative may think we get excited about meeting bears in the wild, but just think of meeting a potential dangerous animal who is free to do whatever it does, naturally… and these creatures just go pass you as if you are just another lamp post. Until tomorrow, cheers.